If I take a five-minute walk, I can see this view of Mt. Rainier. Today is the very first time I sketched it. You’d think I’d be sketching it every chance I get. It’s not a pleasant walk – I have to cross a busy, multi-lane, four-way-stop intersection that should have gotten a signal light many years ago. 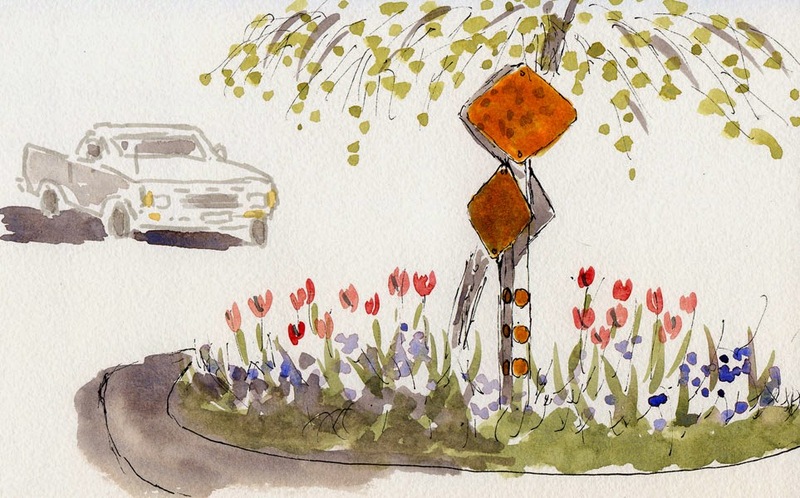 No matter the time of day, everyone’s crabby at that intersection because people don’t seem to know how to use a four-way, so a lot of honking and cussing goes on. Grumpy drivers never watch for pedestrians, so crossing means taking my life into my hands. (Driving there doesn’t help, as there’s no parking.) 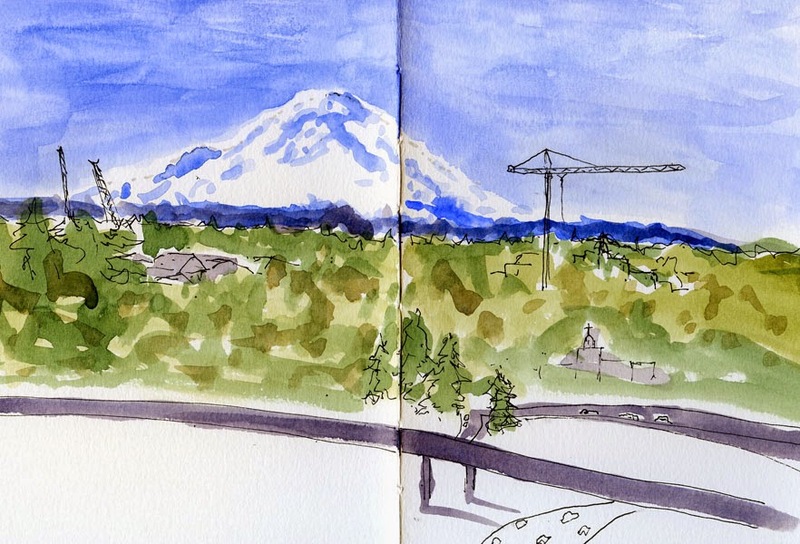 Once I get past that intersection, I have to stand on a heavily trafficked street overlooking Interstate 5, so it’s noisy, smelly and altogether not a wonderful place to sketch. But none of this is why it’s taken me this long to finally sketch Mt. Rainier. The reason is that on most days of the year, a thick cloud cover obstructs it. It was standing room only in the Seattle Public Library Northeast Branch’s community room, so I was happy I arrived early enough for a front-row seat. We were all there to hear Richard Blanco, who was the inaugural poet for President Obama last year. In his inaugural poem, “One Today,” Blanco speaks elegantly and movingly about what it means to be an American. At 44, he’s the youngest inaugural poet. Blanco is also the first immigrant, Latino and gay writer to hold the honor. With humor and eloquence, he talked about his experience as a Cuban who immigrated to the U.S. in utero, the balance between the left and right sides of his brain (he’s an engineer as well as a poet) and his struggles with identity. 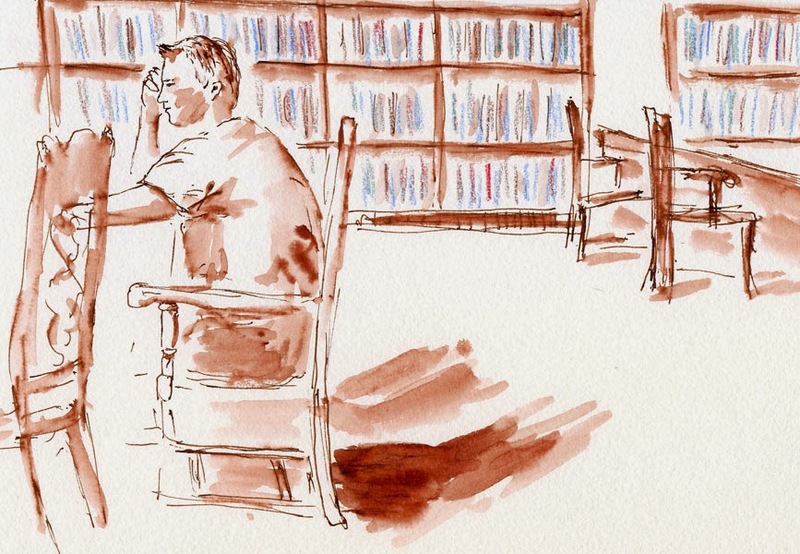 Hearing him read that now-famous poem in the intimate setting of a neighborhood library somehow seemed even more powerful and uplifting than at the occasion for which he wrote it. I knew he had seen me sketching, so I showed him the sketch after the reading, and he autographed it and asked me to e-mail it to him! If you are not familiar with the poem, you can read the full text or view the video of his inaugural reading. With only a short time to spare between errands and appointments, I made a quick stop at Roosevelt Square, where the rooftop-level Starbucks has nice outdoor seating when it’s sunny. 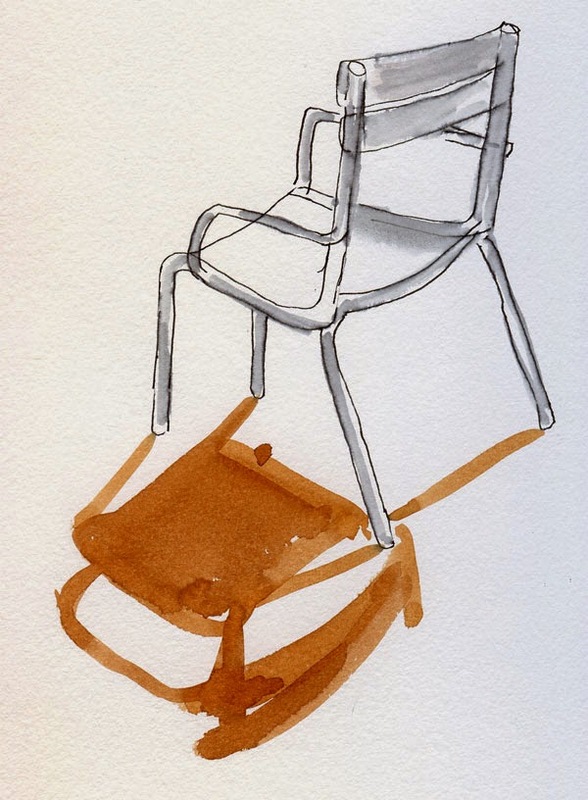 It made for an interesting shadow study of a chair at the next table. The three young people made a more challenging study. The girl facing me was half in shade from the awning, which also made an interesting shadow – if her hair hadn’t dissolved quite so much! But having shadows means there was sunshine, and it was warm enough to sit outdoors – who am I to complain about anything? My "urban palette" of Zig Clean Color Real Brush markers. A blog reader who enjoys using Zig Clean Color Real Brush Markers and who knows that I also use them contacted me recently. She had read on another blog that these markers had proven not to be lightfast, fading away in direct sunlight after only a couple of weeks. 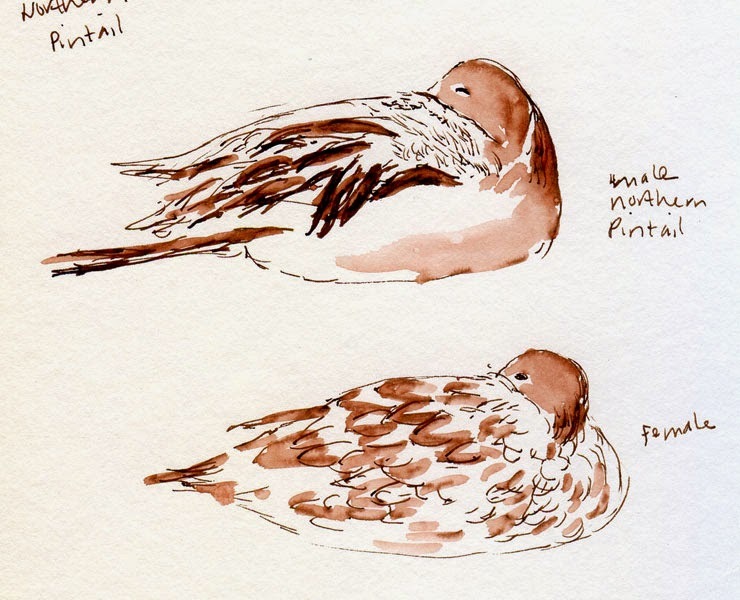 Because she prefers the convenience of Zig markers over other materials, she has not been sketching as much as she used to because of concern over the Zigs’ fugitive quality. She asked me what my experience with these markers has been and whether I knew of similar markers that had greater longevity. I’ve always assumed that Zig markers are not necessarily lightfast or considered archival (the Kuretake website makes no claims that they are), but that issue has not been of primary concern to me as far as sketching goes. 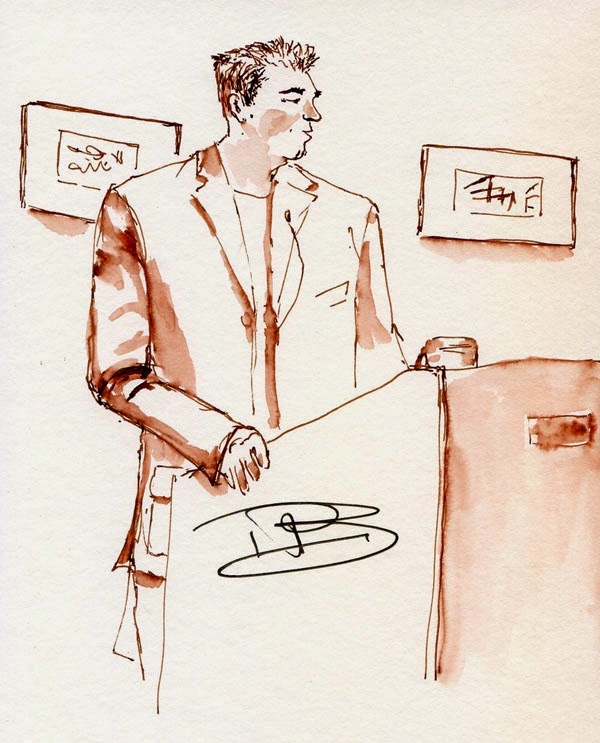 If I ever decide to frame a sketch and hang it on an exhibit wall, I will not use Zig markers (or other fugitive materials) in that sketch. 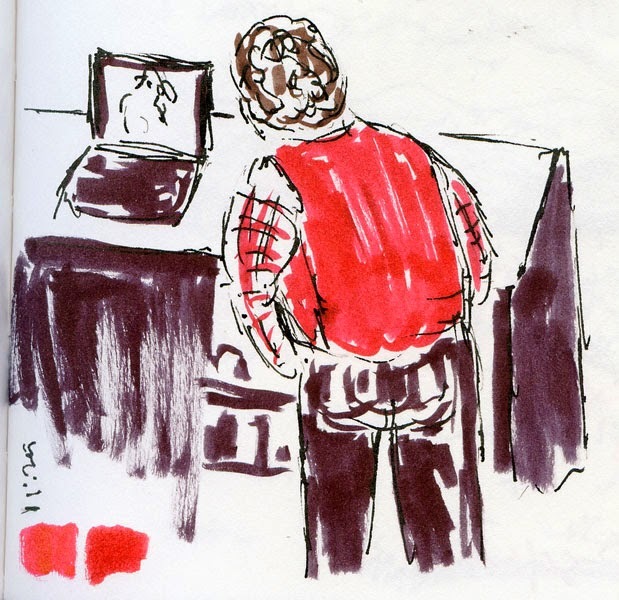 But for my daily sketching, I resolve the lightfastness issue by scanning every sketch the same day I make it, and all the sketches stay in closed sketchbooks that stand on a bookshelf, rarely seeing the light of day. (I do use acid-free paper, because I’ve seen acidic paper deteriorate regardless of how it is stored.) I’m fine with my sketchbooks not lasting much longer than I do. 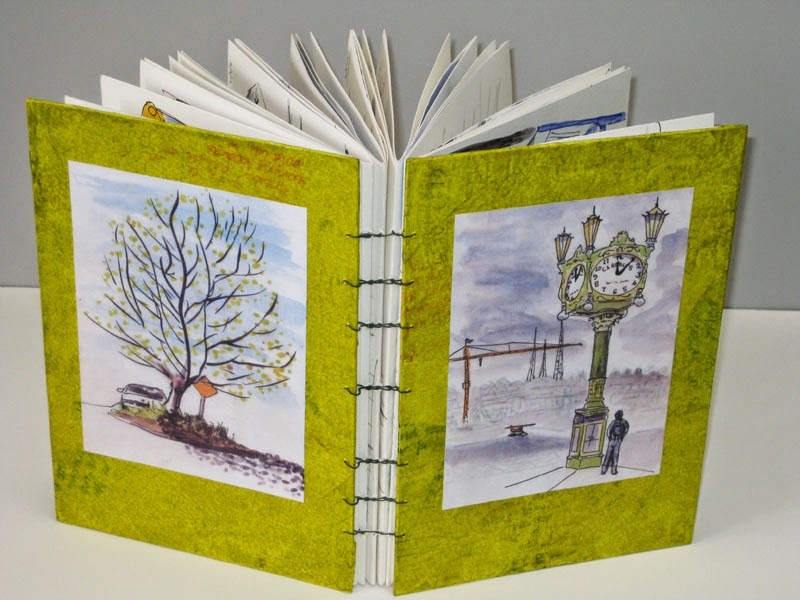 But I can understand that people who want their sketches to last longer than their own lifetime (the woman who contacted me hoped to leave her sketchbooks to her family) would be concerned about the longevity of the materials they use. Since she asked the question and it had never occurred to me to check, I decided to do a test of my own. 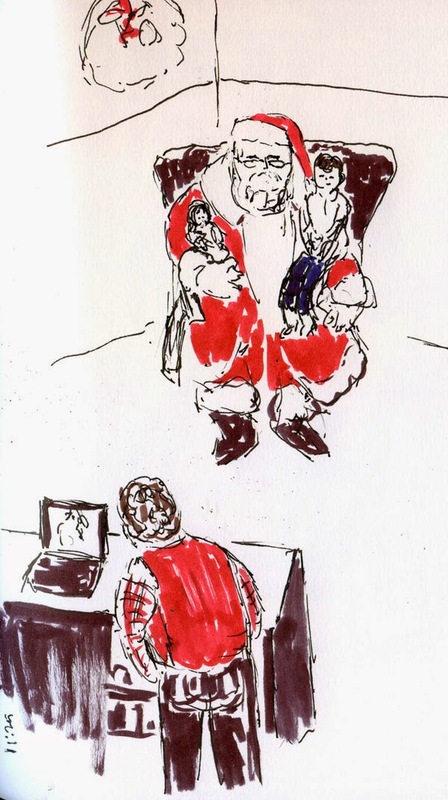 I started using Zig Clean Color Real Brush markers around the end of 2012, so I pulled out a sketchbook from back then and found a sketch dated Nov. 30, 2012: Santa and his helper at the mall, with their red clothing colored with a Zig marker (at left). That Stillman & Birn Epsilon sketchbook has been closed and stored on a bookshelf since I filled it. Zig marker swatches at lower left made on 4/24/14. I still can’t see a difference. Perhaps in five or 10 or 100 years, the color would change even without being exposed to light. But for my purposes, I’m OK with that. Other sketchers need to make their own decision based on their purposes. If concern about an art material prevents sketching, then that is the single-most important reason to stop using it and find a replacement. Because the only thing that really matters is to keep on sketching. 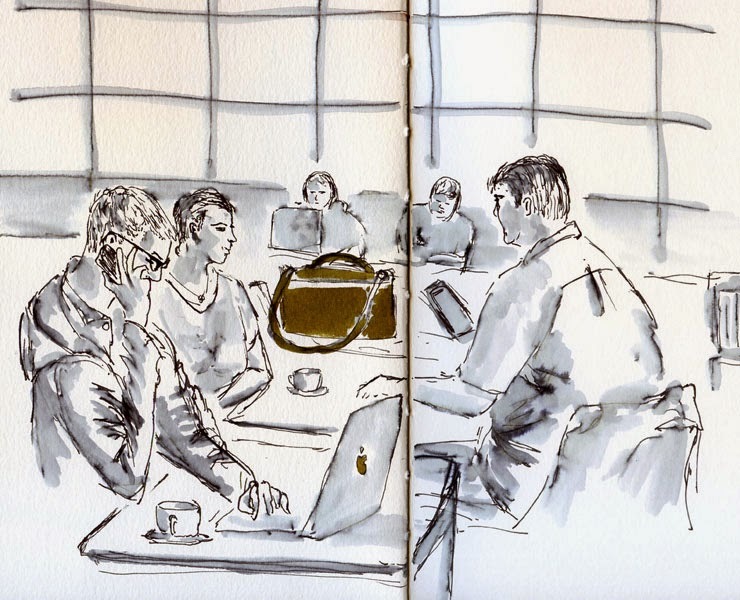 I had a form of déjà vu today when a very small group of Friday ad hoc sketchers met at Suzzallo again. This time I was feeling somewhat cocky – after all, I “passed” Stephanie Bower’s Good Bones workshop only last month! – so I went straight up to the quiet study room, which is as vast and tall as any cathedral. I searched for and thought I found my vanishing point, but just then, right before my eyes, the arched ceiling and walls deteriorated into Dali surrealism. A sketching debacle ensued (see bottom of page). Fortunately, if there’s one thing I’ve learned about sketching, it’s that if a sketch is going badly, abandon it immediately. 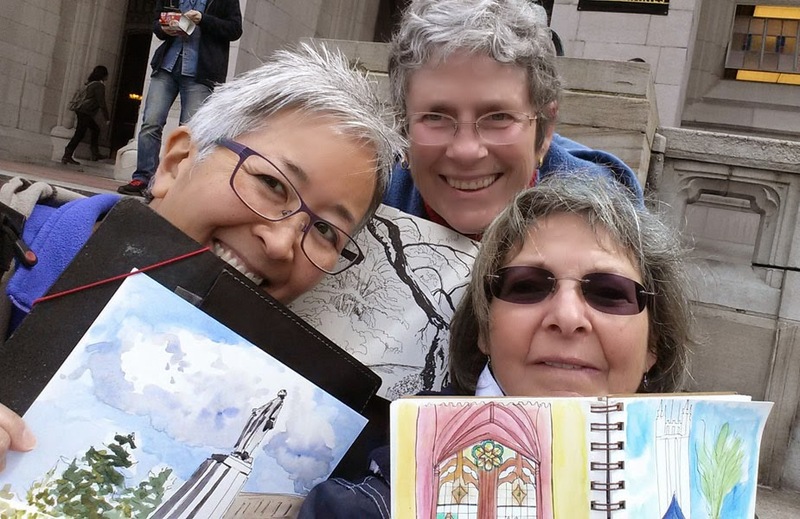 Tina, Peggy and Natalie on the steps of Suzzallo Library. A well-known piece of advice for people who fear public speaking is to imagine that the audience is sitting in their underwear or buck naked. 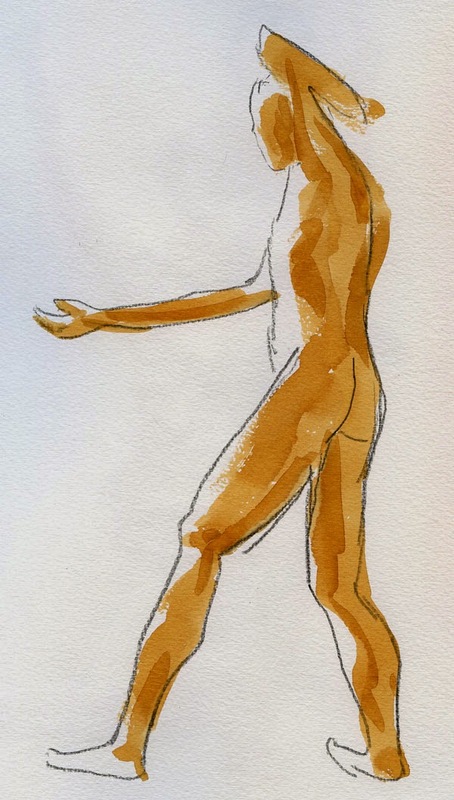 It’s difficult to be intimidated by a disrobed audience: Unclothed people seem vulnerable. 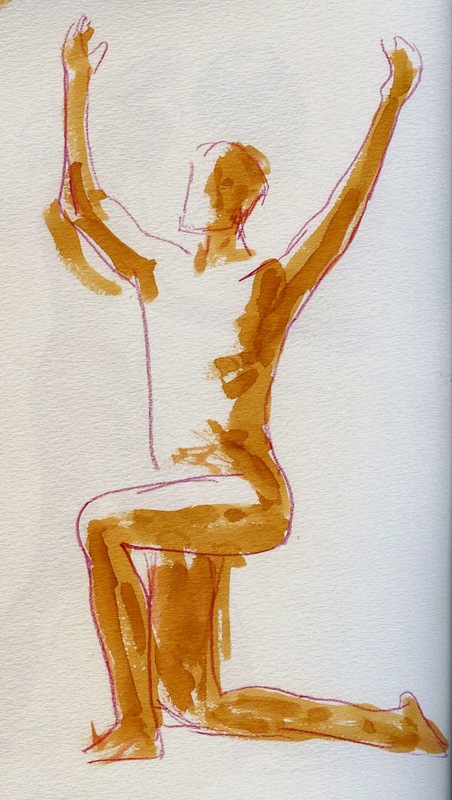 Whenever I go to life drawing sessions, I’m always a little bit in awe of the courage it takes to be naked in front of a roomful of strangers who are there to scrutinize. No matter how much the models are being paid or how much experience they have (and therefore are presumably accustomed to doing it), they are doing something I could never do. To me, it’s the epitome of vulnerability. 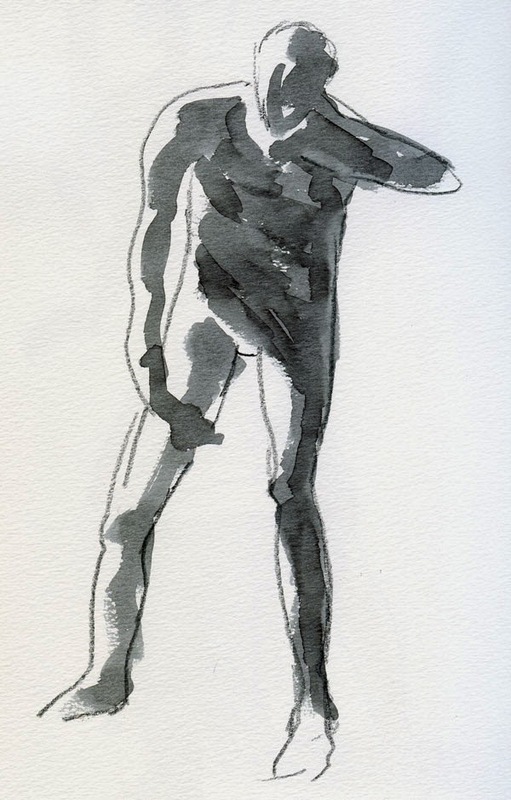 Though I don’t think I captured it, this morning’s model had a particularly vulnerable face. At one point, when I was drawing his ribcage, I could see his heart beating under his skin. Pilling’s Pond is an urban neighborhood gem – a somewhat secret one. In Seattle’s Licton Springs neighborhood, the property has been a waterfowl reserve since the 1920s. According to Wikipedia, 12-year-old Charles Pilling adopted three injured mallards and dug a small pond for them on the property where he lived. He spent the rest of his life breeding and caring for a wide variety of native and exotic ducks. Now supported by a nonprofit agency (Pilling died in 2001), Pilling’s Pond has grown to take up most of the half-acre lot. Anyone driving by on North 90th Street can see the pond and ducks swimming there. And yet I think of it as a “secret” because whenever I drive by, hardly anyone is there enjoying the wildlife. Nilda and I have talked about sketching there several times, so after having lunch together this afternoon, we decided to visit Pilling’s Pond. Nothing keeps the waterfowl within the reserve, so presumably they can fly out anytime (certainly freeloading pigeons take advantage of the comfy ambiance by flying in), and also presumably some have already migrated north. But honestly – so well-fed and breeding in a safe sanctuary, why in the world would they ever want to leave? With sketches dated from March 3 through April 15, my eighth handbound sketchbook is done. 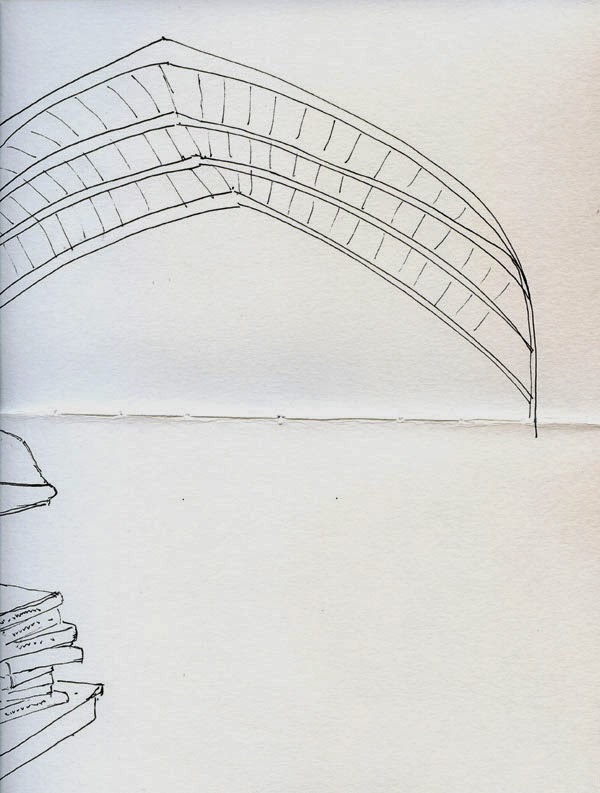 (One book is still in the Museum of History and Industry exhibit, but I count the two separately bound volumes from the Barcelona Urban Sketching symposium and my related travels as one sketchbook, so that’s why you can still see eight books on the shelf [below]. Not that you’re counting, but this blog serves as documentation for myself, so I feel compelled to account for everything accurately.) Featured on the covers this time are sketches of MOHAI’s beautiful clock and a maple finally showing signs of spring. It’s probably not apparent in the photos, but instead of the black bookbinding thread I used on the previous volumes, I tried an olive green thread this time. I like the way the thread coordinates with the various shades of green in the cover sketches. It’s one of several thread colors I got recently from Oregon Art Supply. Although it’s 3-ply like my black thread, it feels a little thinner, so I wondered if it would make a difference in the binding, but it doesn’t seem to. Stitching visible in the center of a page spread. It does, however, bring up an issue I’ve considered occasionally in my bookbinding explorations: how the binding thread looks in the center page spread of each signature. More often than not, I enjoy sketching across the opened page spreads, so the thread ends up marching rather obtrusively down the center of the sketch (see image at left). 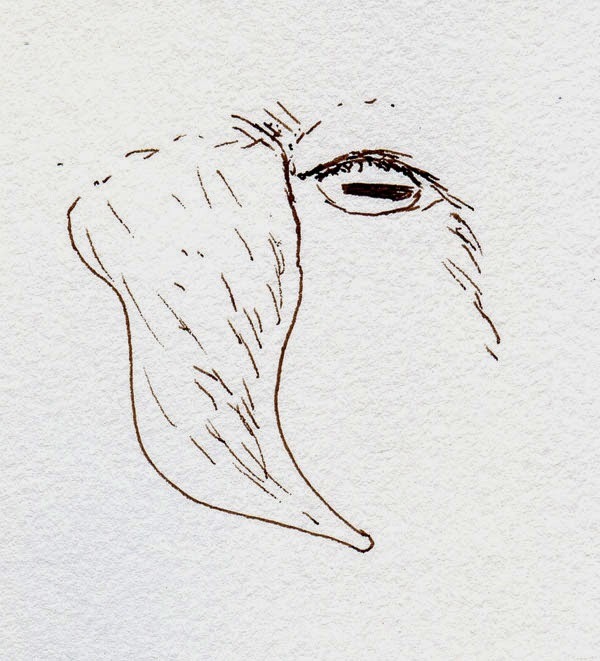 Of course, I always scan the sketches while they are still in signatures that are temporarily stitched with white thread, so the stitching is less apparent in the digitized images (see the blog post in which this sketch initially appeared). I could do the final Coptic binding with white thread, but then I’d lose most of the visual impact of the exposed thread on the spines, which is the thing that appeals to me most about Coptic binding. I guess it’s an acceptable tradeoff: Slightly obtrusive thread in the center of each signature offset by beautiful spines. Even after nine (not counting do-overs from errors and books made while learning) Coptic bindings, I still find consistent thread tension to be a challenge. But that, too, is something I’ve come to accept as part of the hand bookbinding process. 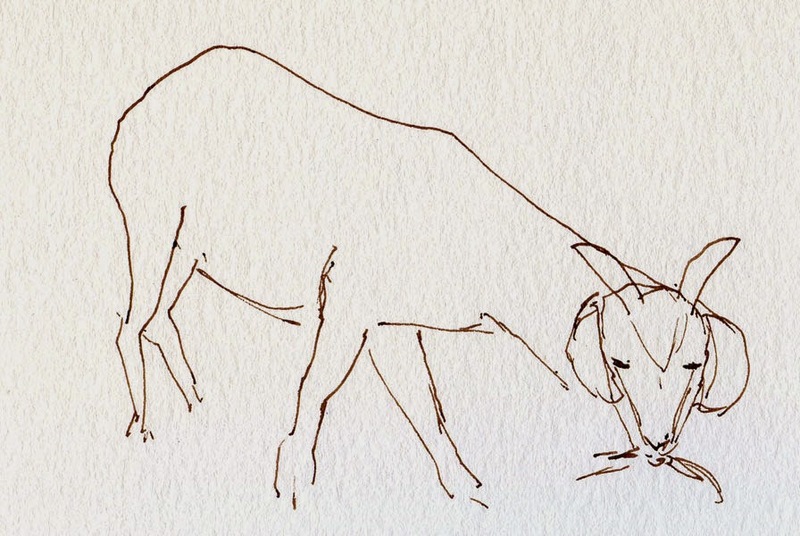 Most of my sketches are wonky in some way; if the binding is too, then they are made for each other. Read more about my bookbinding process. 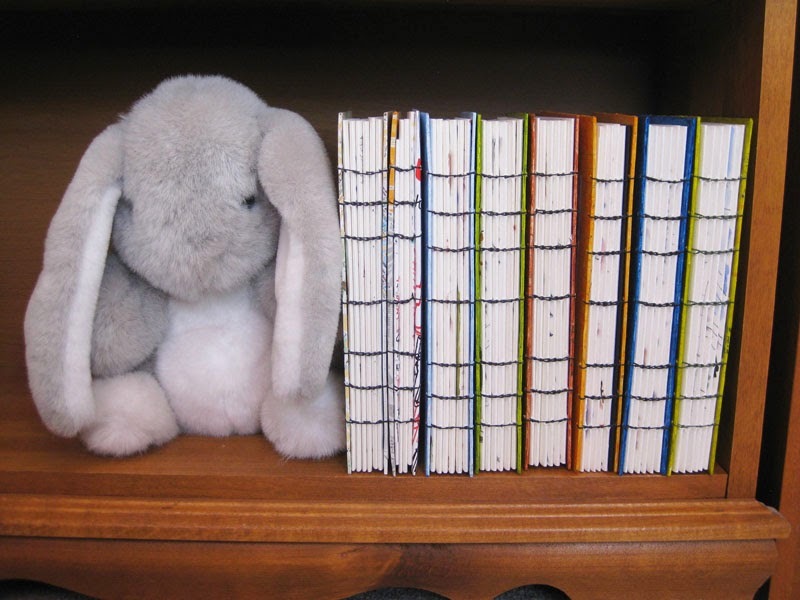 My handbound sketchbook collection (with an old fuzzy friend serving as a bookend). Seated on the throne this morning, looking out the window at the steady rainfall, I started thinking about what I could sketch inside the house. I’m not enrolled in Danny Gregory’s Sketchbook Skool, but I’ve been looking through some of the participants’ homework uploaded to Flickr, and I know that ordinary household items are a common theme (going all the way back to Danny’s Everyday Matters). 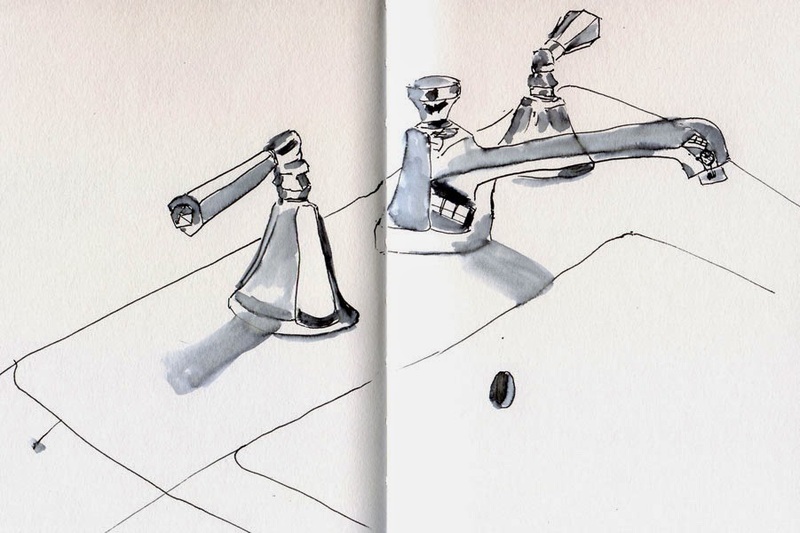 I also recalled an Urban Sketchers Flickr group weekly theme a year or so ago: “Sketch the bathroom.” Inspired by all of that, I turned my head in the opposite direction from the window and found a tightly angled view of the sink (our bathroom is very small). The weatherman kept saying rain was expected today, but the comfortable temperature and patches of blue between clouds made me bold. I popped the top down and cruised up to Queen Anne Hill for one of my favorite views of the Space Needle and the downtown skyline from Highland Drive. 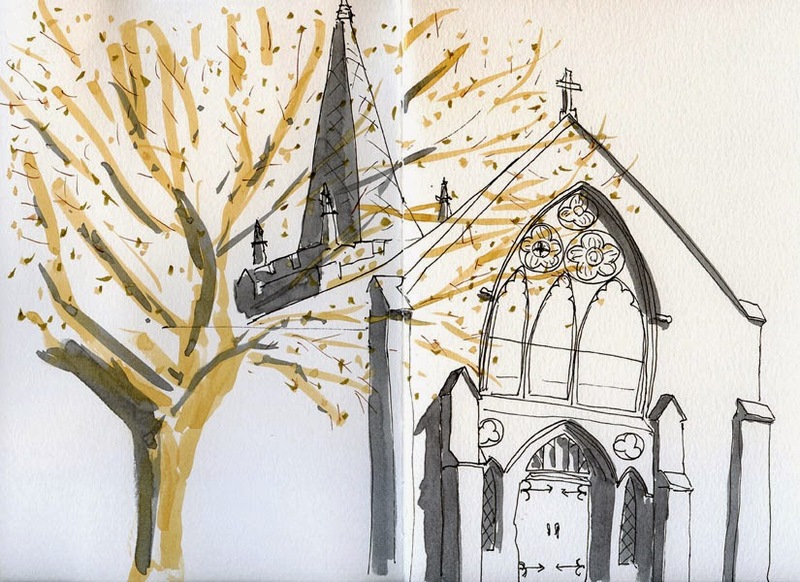 The sky was getting bluer by the minute, so I took a detour before heading home to sketch Bethany Presbyterian Church on Queen Anne Avenue. It was actually the steeple – somewhat hidden by a tree – that had initially caught my attention, so I drove around the sides and back of the church, trying to find a better view. It turned out that the obstructed view from the front was still the best, so I included the front elevation (and, of course, the tree in the way). Drawing the arches and other Gothic details instantly brought me back to the Köln Cathedral in Germany as well as many buildings in Barcelona. Today, as then, I channeled my inner Inma (Serrano) to try to bring the building to life. 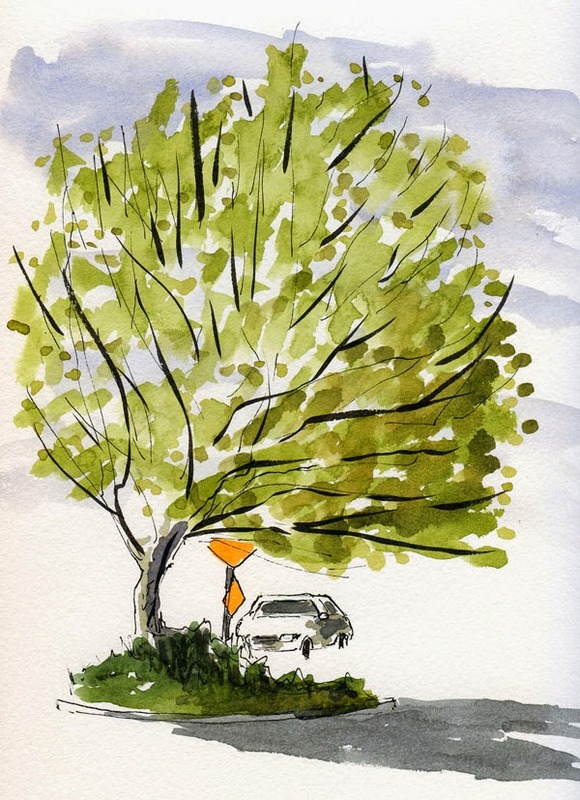 When I sketch our neighborhood traffic circles, I usually take a slightly wider view so that I can capture the trees in the center. But today these cheerful tulips deserved a closer look. 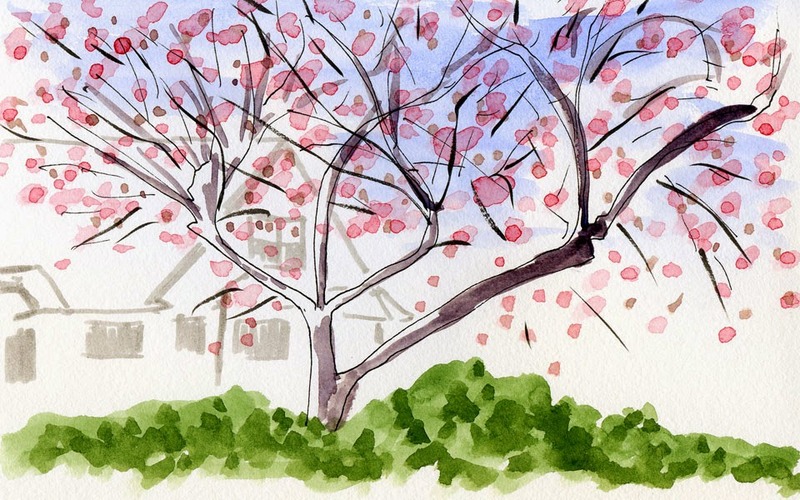 Happy Easter, happy spring, and happy outdoor sketching weather (I hope for all of you)! 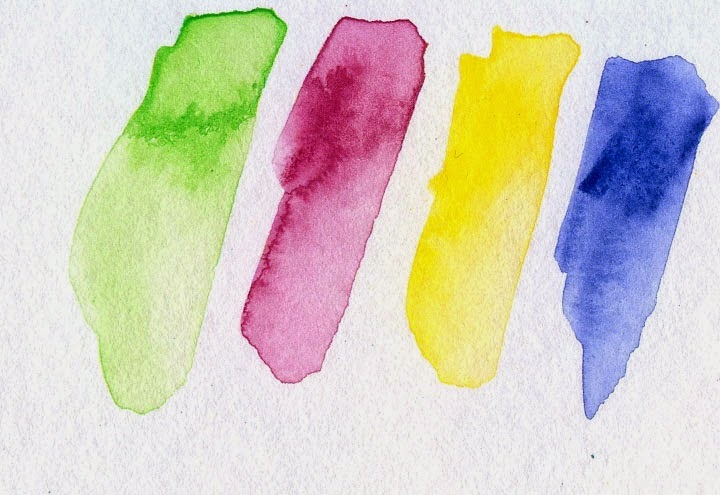 The 12 colors in the set (applied to Stillman & Birn Beta sketchbook). Unfortunately, after studying a few books on colored pencil techniques and trying my hand at using them for a while, I realized they weren’t my medium of choice. All the small, careful strokes needed to “paint” with colored pencils tried my patience, not to mention my hand and wrist’s ability to withstand repetitive motions. 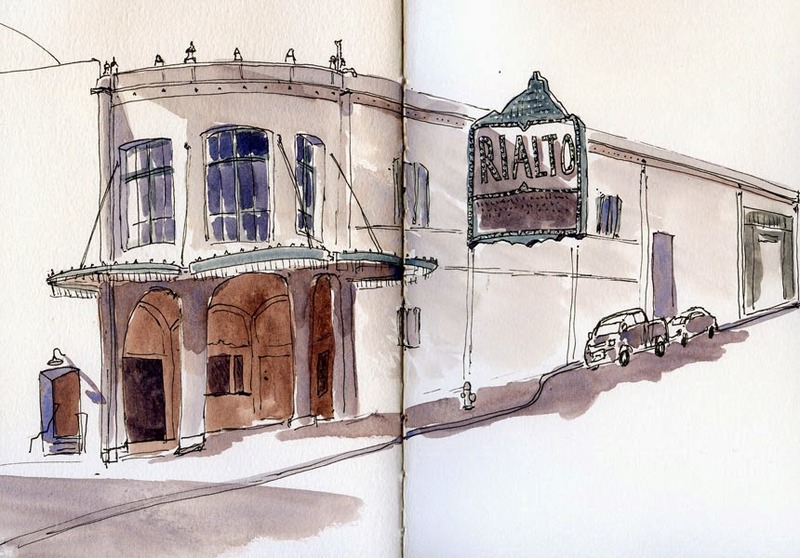 I also realized that, as portable as they are, colored pencils aren’t ideal for urban sketching. 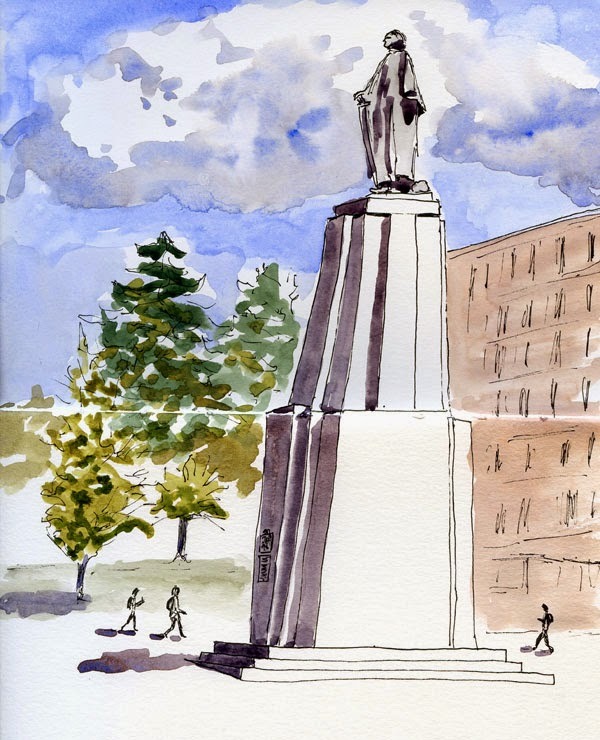 Although I know some urban sketchers who do unbelievably beautiful work on location with colored pencils (Alissa Duke springs immediately to mind), the time it takes to do it well just isn’t for me. So although I still like to play with colored pencils on a rainy day like today, use them in museums, and use water-soluble ones in life drawing sessions, I don’t otherwise pick them up much. Yet, like a woman who collects way more jewelry than she could ever wear, I still find colored pencils somehow coming into my possession. Even though watercolor has been my urban sketching color medium of choice since the beginning, I don’t feel at all compelled to collect and accumulate paint tubes. (In fact, I’m always trying to reduce the number of paints I use.) But there’s something about colored pencils. 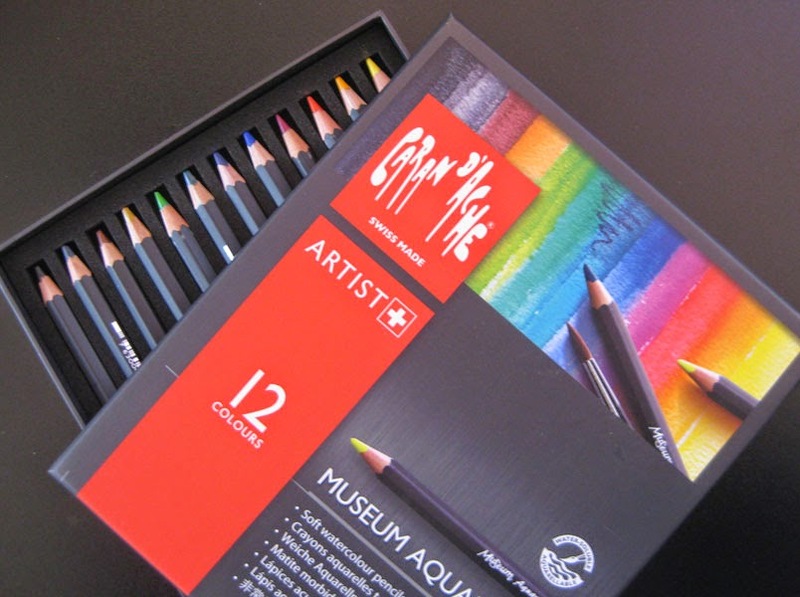 . .
All of that comes as a way to explain how a box of 12 Caran d’Ache Museum Aquarelle water-soluble pencils came into my home the other day, especially since they are probably the most expensive water-soluble pencils I’ve seen to date. Roz Stendahl mentioned them on her blog a while back, which made me perk up because I hadn’t heard of them before. Anyway, I won’t bother to pretend to have an excuse (but at least I bought the smallest assortment available). Now, on to the product review. . . The first thing I noticed about the Museum pencils is that, in their dry state, they are definitely the softest, creamiest, most concentrated colored pencils I have ever applied to paper. The marketing brochure that came with them didn’t say much, but my guess is that they contain more pigment and less binder than most other colored pencils. 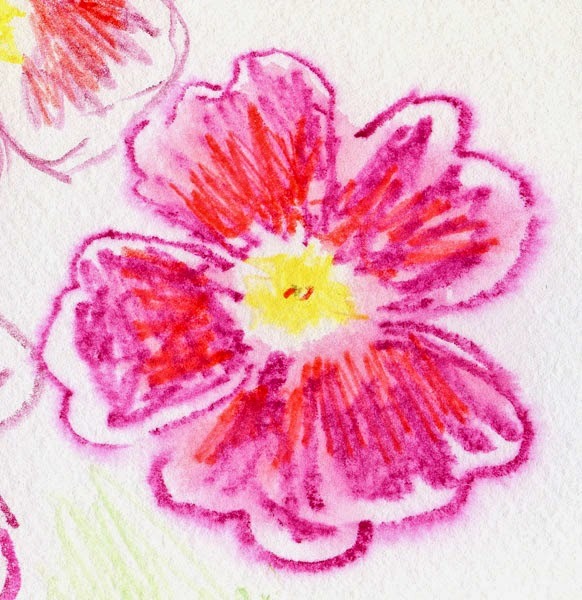 It takes very little water and few brush strokes to activate them on paper, and once wet, they look as much like wet watercolor paint as any initially dry medium I’ve seen. For comparison, I did some sample swatches of Faber-Castell Albrecht Dürer pencils and Caran d’Ache Supracolor II pencils, which are both excellent pencils but less expensive than the Museum line. Once activated with water, all three pencils have strong, rich colors that look a lot like wet watercolor paint. I think the main difference I could find was that the Museum pencils were much softer to apply – almost like oil-based crayons. 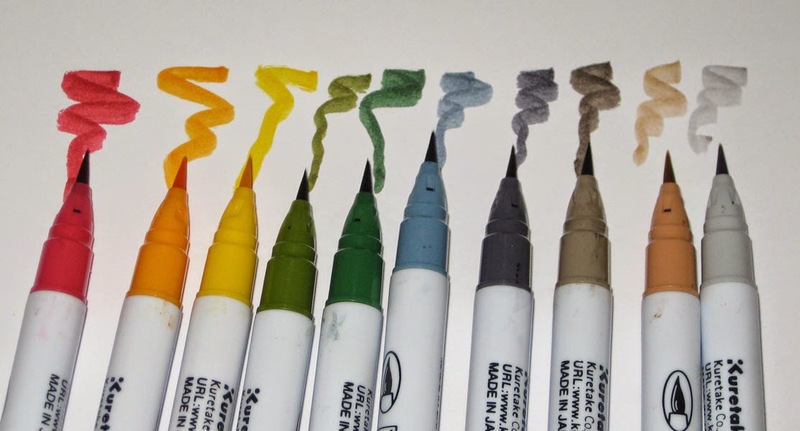 I tried applying them dry and then brushing them with water (which made colors blend beautifully). I also tried wetting the paper completely first, then applied the pencil to the wet paper, and that’s when they really seemed to glide effortlessly with vibrant color. But as soon as I hit a spot on the paper that was nearly dry, the pencils skidded to an unpleasant, unpigmented stop (very unlike completely dry paper, where the pencils went on smoothly). I’m not skilled enough to control them on varying degrees of paper wetness, but I’m sure someone else knows how to take advantage of these qualities. Are they worth the extra cost? Probably not the way I use them. But I’m thrilled to have shiny, new jewels to wear take with me to my next life drawing session. And as their name implies, they will be in my bag the next time I want to sketch in an art museum (and don’t want to be reprimanded by a guard like last time, when I thought I could get away with markers). 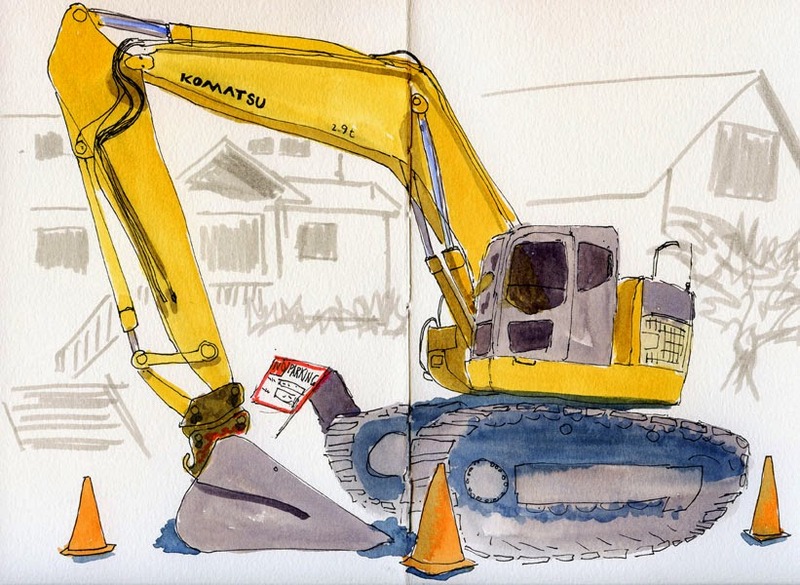 Updated 12/17/18: When I wrote this review nearly five years ago, I had been playing with water-soluble colored pencils for a while, but my drawing experience with them was minimal. 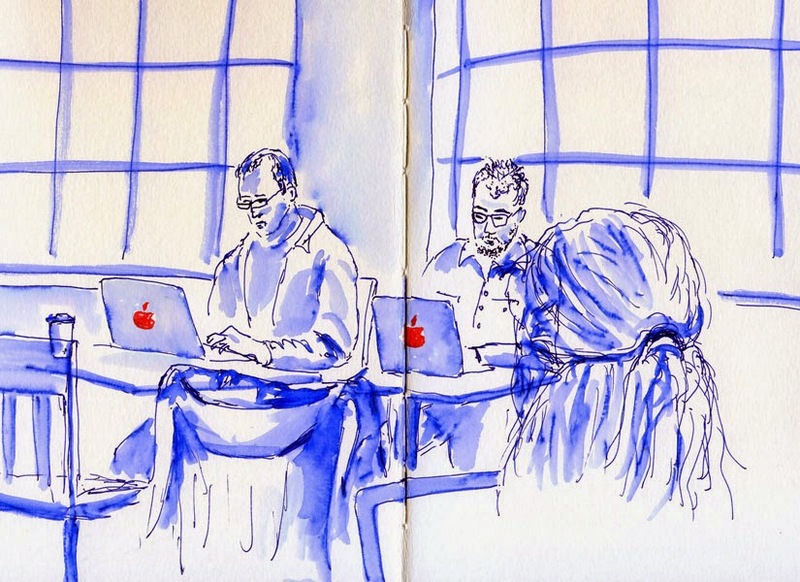 I had not yet begun using them for urban sketching. Since then, I’ve learned so much about how to use watercolor pencils to get the best effects, and the more I use Museum Aquarelles, the more I appreciate their qualities. I ended this post questioning whether they are worth their premium price. Today, I would answer that they have proven time and time again to be worth every penny. 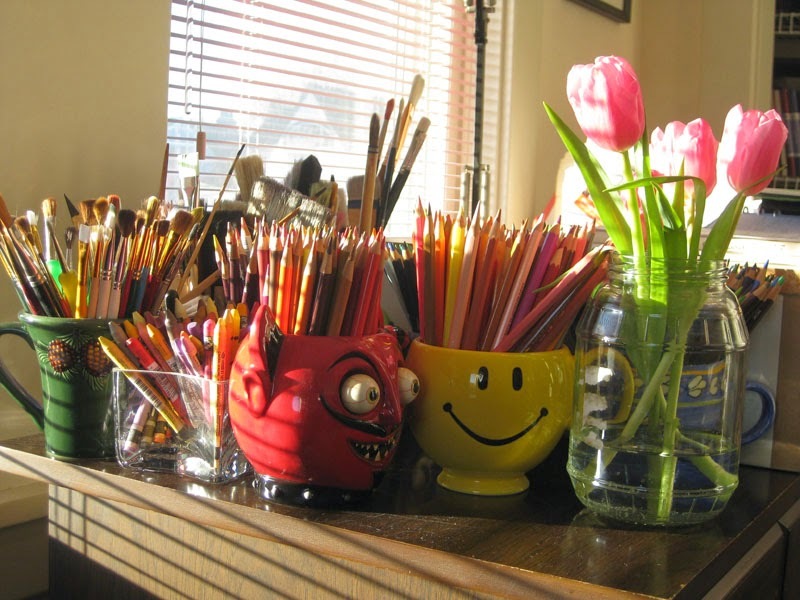 Please see this post for more reasons why these pencils continue to be my all-time favorites. Shown at right is a more recent sketch that I think is a better example of the pencils’ potential than the ones in my original post. Technical notes: Today’s tree might be something of a small watercolor milestone: I think I’m finally ready to ditch the sap green paint that has been in my palette for probably a year (preceded by various other greens before that). I used to depend on greens from the tube, at least to get me started in a mix and sometimes entirely. But the longer I sketch, the braver I become in mixing my own greens from various combinations of blues and yellows (with uneven success). I used to think it was the blue that was critical, but now I’m finally learning that it’s the yellow that makes the difference between an OK green, a really muddy one or a vibrant one. All the greens in today’s sketch were made with varying combinations of nickel azo yellow (which I learned about from Stephanie Bower), Quinacridone Gold, French Ultramarine or Indigo. Not a touch of that sap green was used. It hasn’t been used in quite a while, but I left it in my palette as a security blanket. I’m ditching it – and maybe I’ll replace it with something more useful. Any suggestions on one or two really useful colors to add? 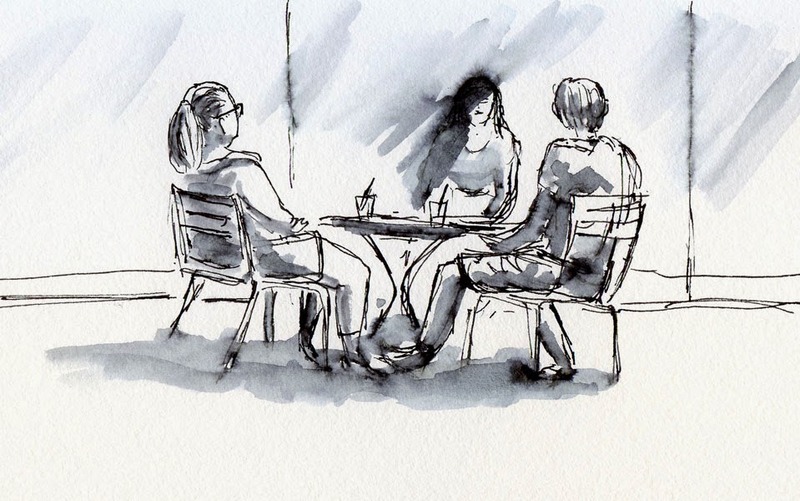 The ongoing drizzle today drove me to Zoka Coffee for an Americano and to try out a new ink sample: Diamine Sargasso Sea. When I was scribbling with it at home, the intense shade of blue – which looks nearly purple when wet – really appealed to me. But under all the soft natural light streaming in through Zoka’s high windows and against white watercolor paper, it was almost too bright. 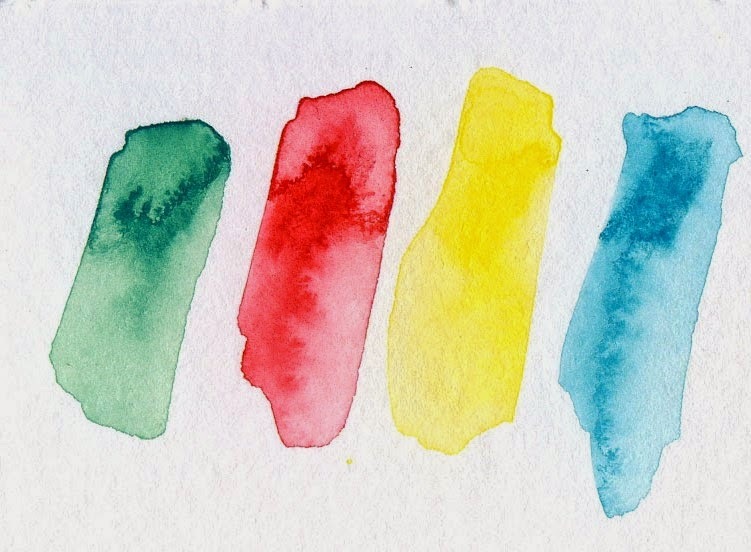 I’ve found all Diamine inks to be beautifully wet-flowing, and Sargasso Sea is no exception. Coupled with my smooth Metropolitan, I get a consistently rich, bold line. I do like how easily it shades with just a touch of my waterbrush, but by the same token, it’s more difficult to control the ink’s intensity when I want more subtle shading, like on faces. 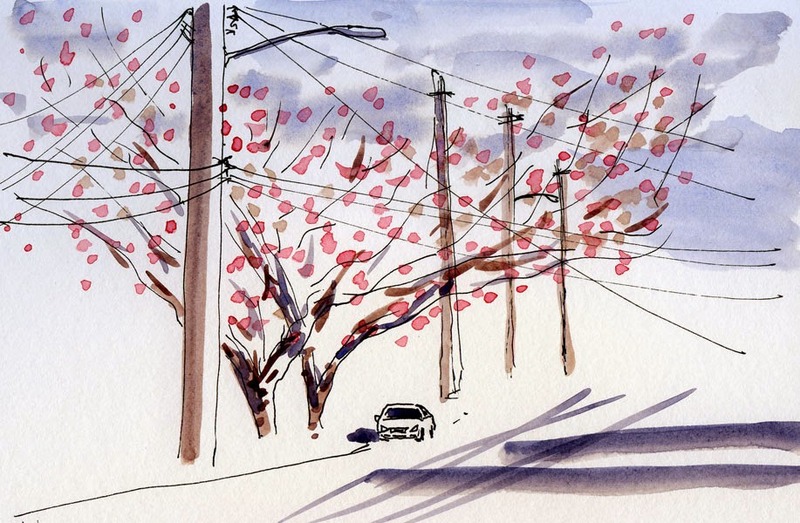 With all the trees mashed by power lines that I’ve been sketching lately, and with all the blossoming cherry trees I’ve been trying to catch before they disappear, I kept hoping to find a cherry tree that had been split by power lines so that I could sketch two themes in one. That tree turned out to be just around the corner on Fifth Avenue Northeast, but I hadn’t noticed earlier because I have to pay attention to cars while I make the turn onto my street at that intersection. Yesterday I guess I wasn’t paying as much attention to cars, because suddenly there it was – two cherries, in fact. They’re not quite as badly mutilated as some trees I’ve sketched, but it’s impressive that they are wider than they are tall. Did my blog post title get your attention? It got mine when I saw it as the subject line of an e-mail I received today. 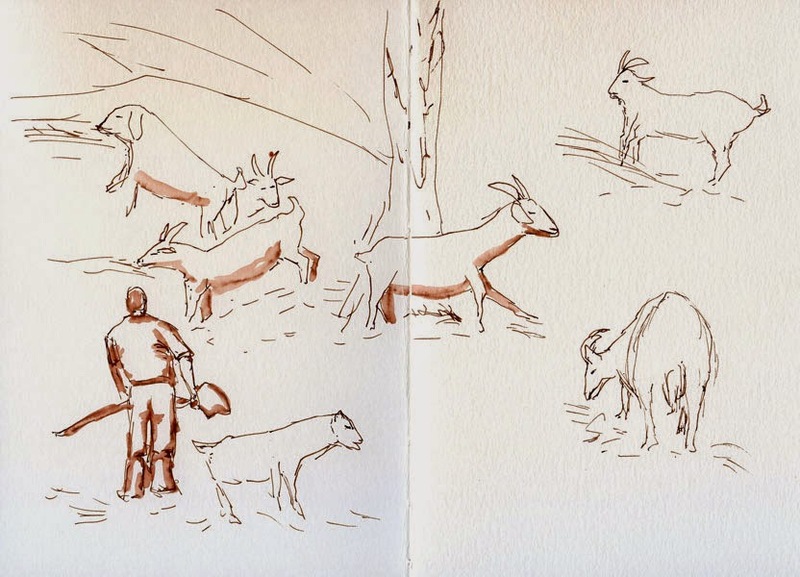 On a few occasions, I’ve seen goats “mowing” hilly, overgrown properties within the city, but they’ve always been too far from the street to sketch. 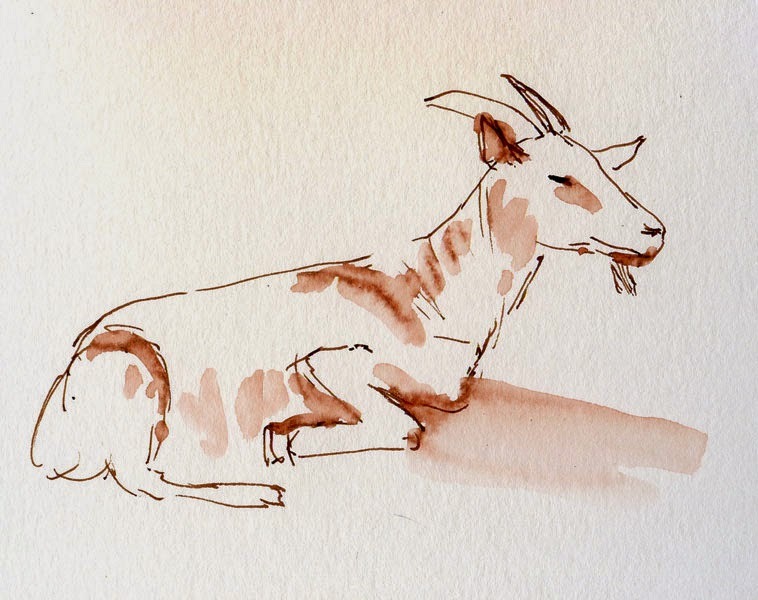 My friend Tony let me know that a herd of goats was busily at work near I-5 in the Roosevelt neighborhood, in case I was interested in sketching them. Who could resist a lead like that? I dashed right out. The goats, managed by Rent-a-Ruminant, had quite an audience when I arrived at the property just off the Northeast 65th Street freeway exit. 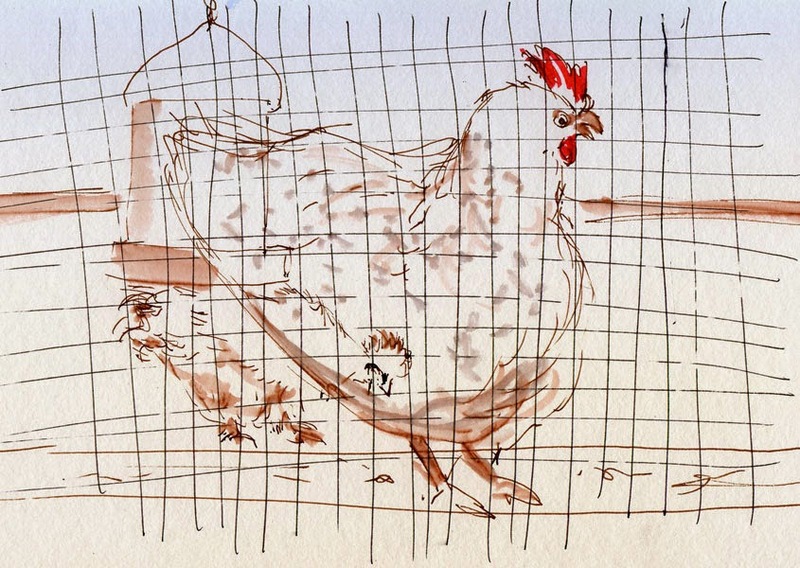 People of all ages were peering through the chain link fencing, snapping pictures of the ruminants as they grazed on long grasses, weeds and blackberry bushes. 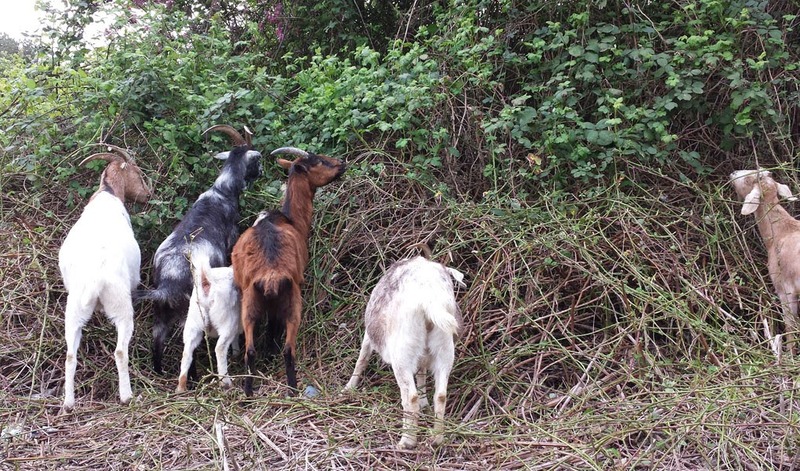 The land slopes up abruptly there, and I could see how humans with power mowers would have difficulty clearing the area, but it was no problem for these hungry goats. A human team member helped them out with a weed whacker. one composition was difficult. After a while, I gave up on that and moved over to a flatter part of the property, where nearly half the herd (I counted a total of 38) was chewing their cud or simply dozing. 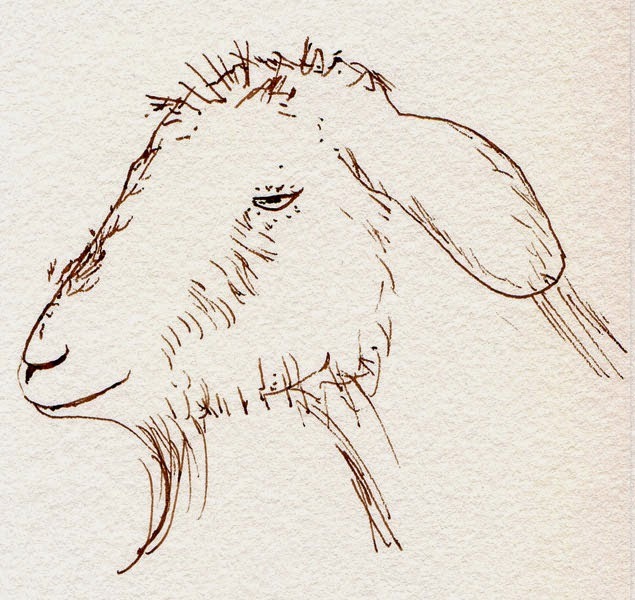 These resting ruminants gave this city girl a rare opportunity to sketch details of their strange horizontally slotted eyes and wispy beards. 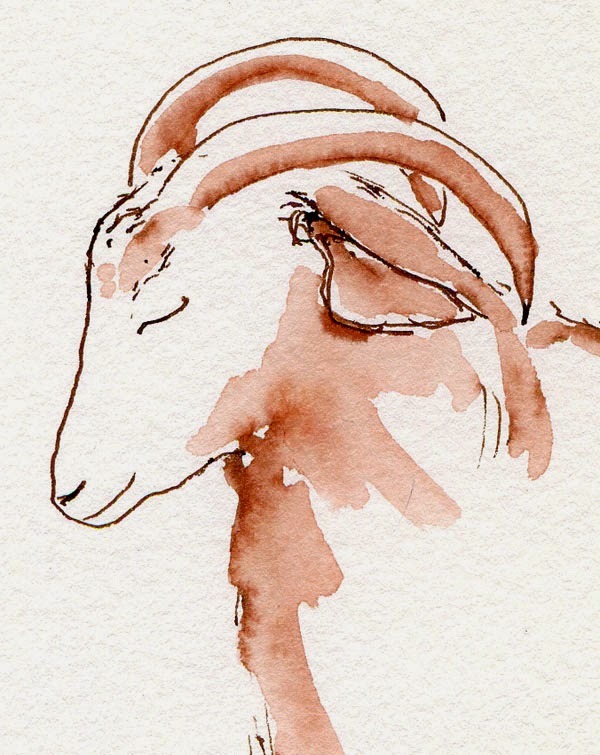 Sure, I’ve sketched goats at the Puyallup Fair and Woodland Park Zoo, but somehow these urban goats seemed more laid back. After all, they get hired to eat, rest and repeat – not a bad way to earn a living. A little past its prime, this beautifully asymmetrical cherry tree near Green Lake was nonetheless giving its all. 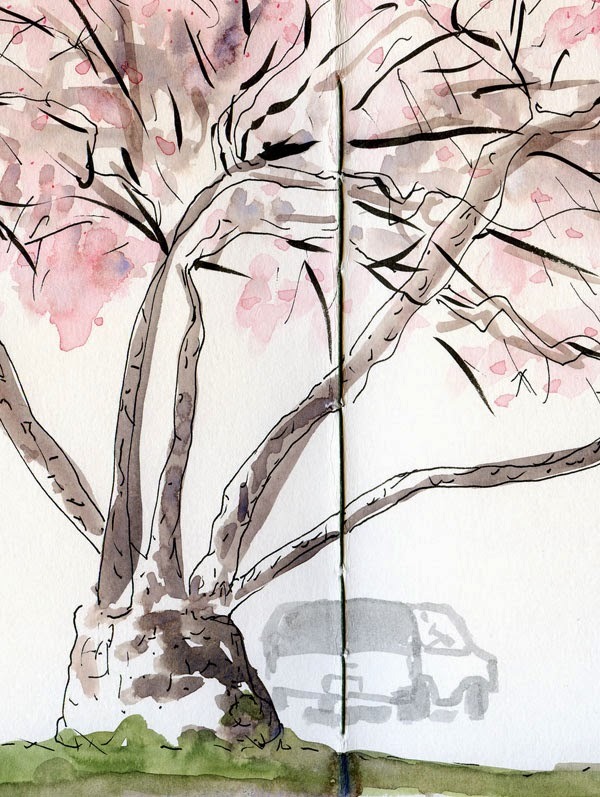 The fat, round clusters of pink blossoms were still as exuberant as I was, dressed in T-shirt and sandals as I sketched. As I settled down on a bench and pulled out my usual pen and watercolors, something about the playground scene reminded me that I still hadn’t done a sketch for this week’s Urban Sketchers Flickr group theme, Value Drawing – “Don’t draw lines, only tones.” And then I remembered that I had done a monochrome ink sketch of the same scene about a year ago. 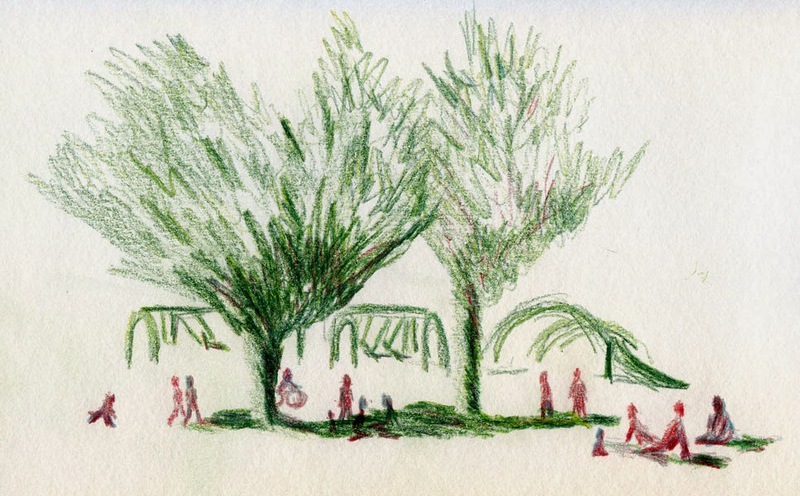 The busy-ness of the playground and the two trees and their shadows must lend themselves to tonal sketching. 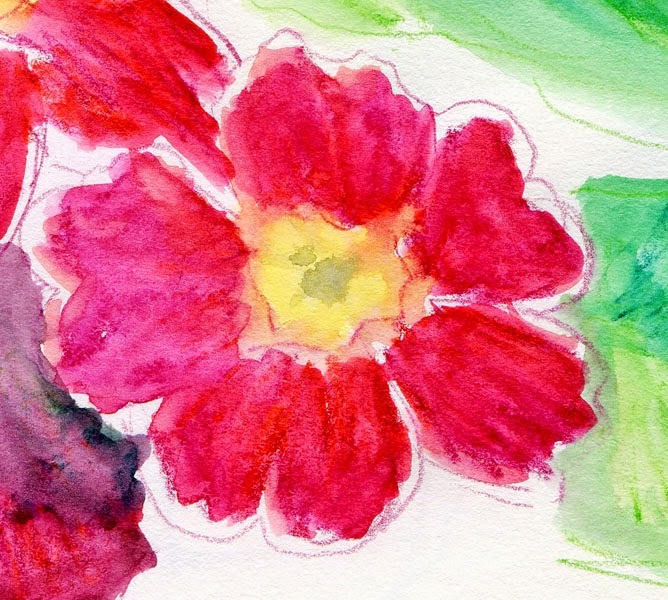 When I’m using watercolors, I feel compelled to create hues that match reality as much as possible. I know I don’t have to, but I can’t seem to help myself. When I’m focusing on value, though, I feel liberated to use any color. And so it was today when I pulled out the only two pencils in my bag: Koh-I-Noor Tri-Tone colored pencils, one with shades of green and a second with an odd mix of reds and pale blue. The fact that they were both somewhat unsharp also saved me from the temptation to draw in details. 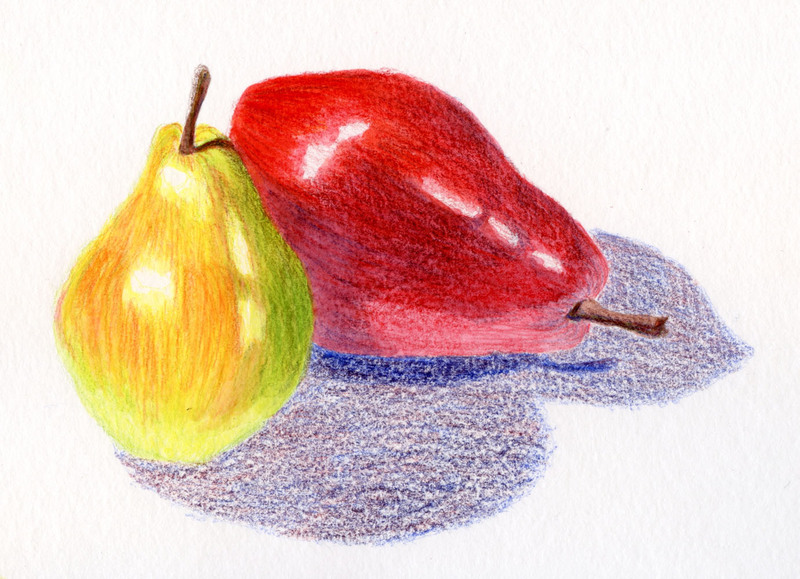 I don’t use graphite pencils much, but these multi-hued pencils are a fun kick in the pants! 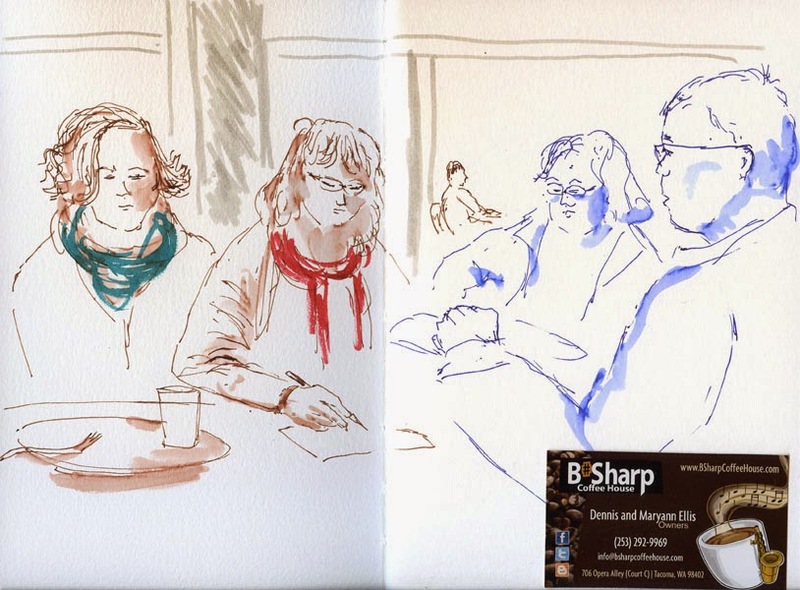 The Friday ad hoc sketchers were meeting at the historic Panama Hotel and teahouse, but I think everyone had it in the back of their minds to sketch outdoors if we lucked out on weather. 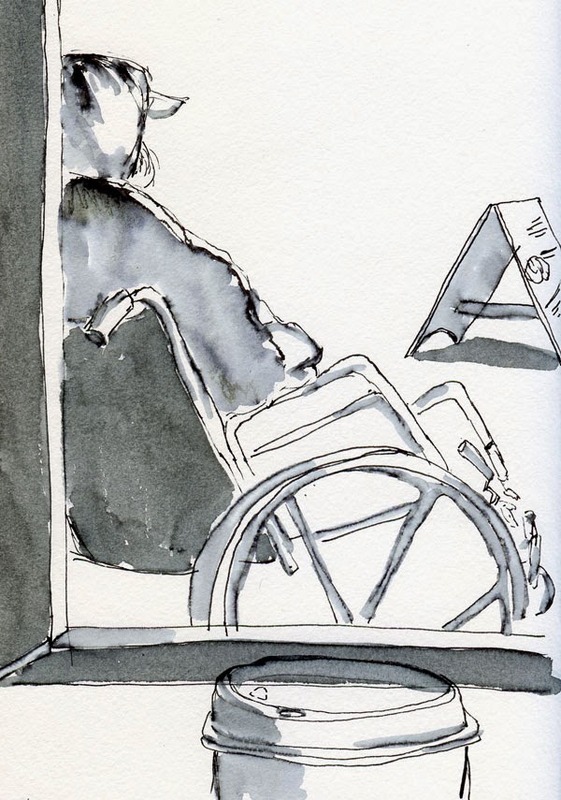 Indeed, despite a bit of a chill, the sun was out, so most of us opted to walk across the street to sketch at the Danny Woo International District Community Gardens. Rich with trees, vegetable and flower gardens and even a chicken coop, the multi-tiered space is a tangle of crooked stairways and surprising peek-a-boo views of many downtown landmarks. 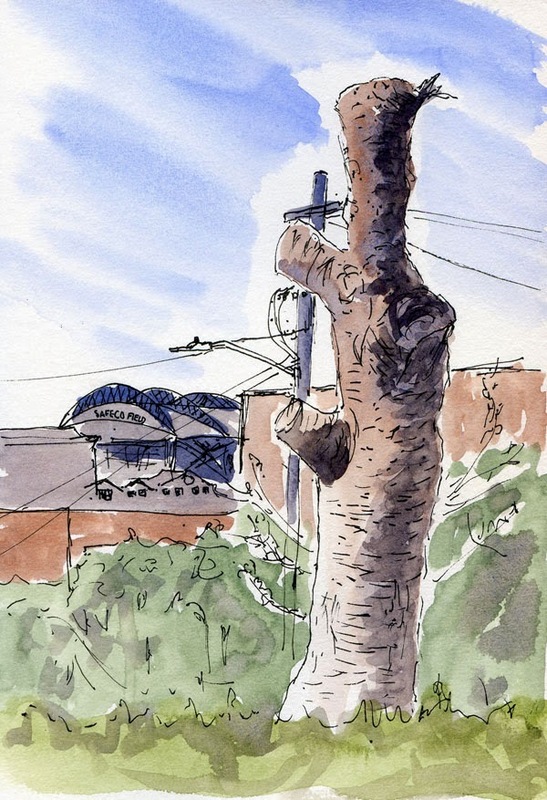 After a quick sketch of a couple of garden residents clucking and scratching in their coop, I settled in to sketch a tree that had been cut down with Safeco Field behind it. Like several other sketchers, I decided this community garden is worth several return visits, especially as the weather improves. I explored the gardens a bit more, then went back to the Panama Hotel to warm up with a cup of genmaicha and a matcha green tea shortbread cookie. 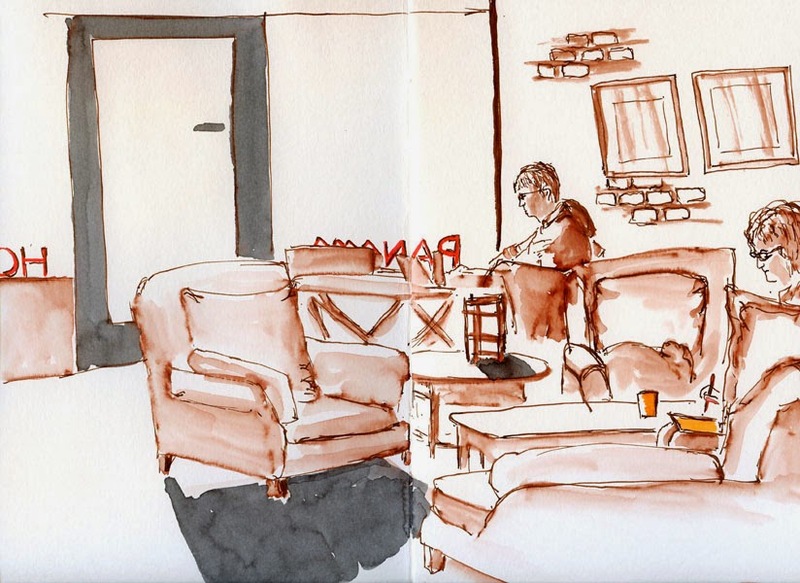 Now used as a bed and breakfast and teahouse, the Panama Hotel (which figured prominently in the popular novel Hotel on the Corner of Bitter and Sweet by Jamie Ford) is full of comfy furniture and fun décor to sketch.